A few weeks ago, my nephew came to spend some time with me. He’s five and will be entering kindergarten in the fall. He was very excited to learn that we have not finished our current homeschool year, because that meant he could homeschool with us. 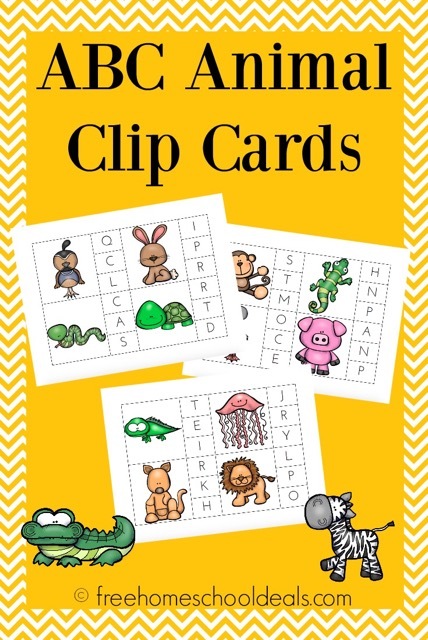 I whipped up this fun set of ABC animal clip cards for him. He’s a pretty smart cookie, and was able to correctly identify the beginning sound of most of the animals on these cards. I had him use paperclips, but your kiddos can use clothespins or dot markers to identify the correct letter if you choose.